Last year, the United States suffered a record number of devastating weather and climate disasters, including hurricanes, tornadoes, wildfires and floods, causing the President to issue a record 99 “major disaster declarations” during 2011. However, the U.S. unfortunately had a lot of company as the entire world endured one of the worst years ever for catastrophic natural disasters. 2011 was the costliest year on record in terms of global property damage, with more than a third of a trillion dollars in damages worldwide, according to Munich Re, a multinational that insures insurance companies. The single worst and costliest natural disaster of the year was Japan’s earthquake and subsequent tsunami and nuclear disaster. But some of the other worst disasters in the world in 2011 included: floods and landslides in Thailand, Guatemala, El Salvador, Pakistan and Brazil; earthquakes in New Zealand and Turkey; severe spring storms and tornadoes in the USA; Hurricane Irene in the USA; Cyclone Yasi and flooding in Australia; drought in the USA and Somalia; wildfires in the USA and Canada; and the violent winter storm Joachim that swept across western Europe in December. Image: The world’s natural disasters of 2011. 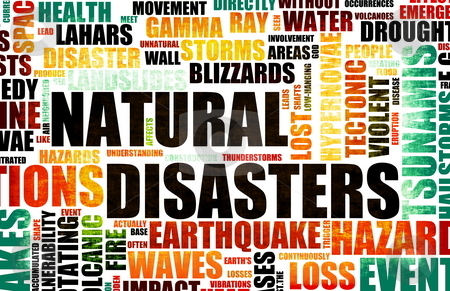 Source: “2011 was costliest year in world disasters” USA Today, January 4, 2012. Fortunately, while the total number of disasters was about average, the loss of life was below average. Still, many lives were lost around the world, including 15,840 fatalities reported in Japan’s disaster alone. To help local governments around the world respond to these disasters, the United States Government often comes to the rescue with supplies, personnel and logistical support. But sometimes civilian agency response is not sufficient. In these cases, the U.S. Department of State and U.S. Agency for International Development may ask for support from the U.S. military. 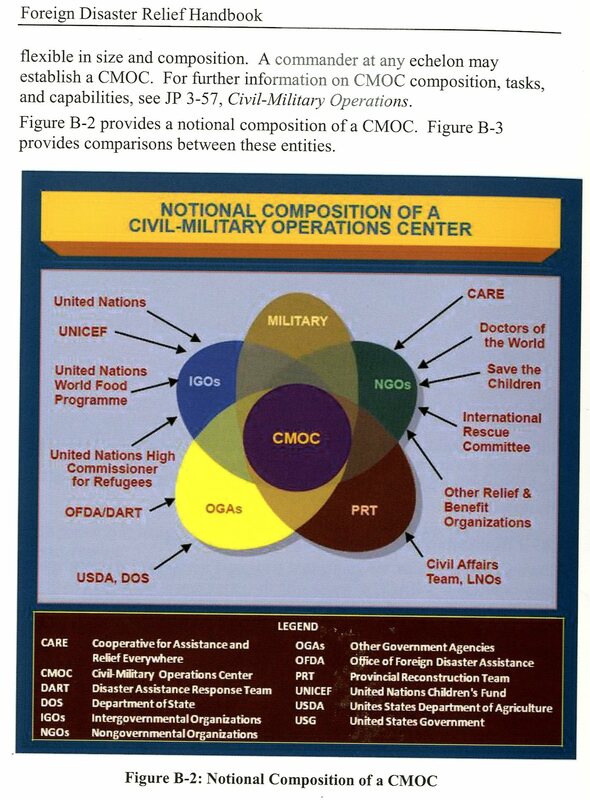 U.S. Government and Department of Defense (DoD) joint task forces may also coordinate with International Organizations such as the United Nations and International Red Cross and Red Crescent and other Intergovernmental Organizations (IGO) and Non-Governmental Organizations (NGO). In total, the U.S. Government on average responds to approximately 70 to 80 natural disasters worldwide annually, but the Department of Defense (DoD) only lends support to 10-15 percent of these disaster responses. Some of the past disaster response efforts with which the U.S. military has assisted include the 2004 tsunami in Southeast Asia; 2005 earthquake and 2010 flooding in Pakistan; and the 2010 earthquake in Haiti. To assist their personnel who are engaged in foreign disaster relief operations, the Department of Defense prepared a handbook which “offers an overarching guide and reference for military responders in foreign disaster relief operations,” particularly for Joint Task Force (JTF) Commanders and below. INTENDED FOR ANYONE INVOLVED IN US FOREIGN DISASTER RELIEF OPERATIONS: Fortunately, DoD also released an unclassified version that can be used not only by the military, but also by anyone involved in U.S. foreign disaster response operations, including U.S. Government agencies, international organizations, Intergovernmental Organizations (IGO) and Non-Governmental Organizations (NGO). Section I: Introduction: Provides the background, legal authorities and guidance for performing foreign disaster relief (FDR) operations. Includes info on the U.S. Government’s FDR response processes, international and humanitarian guidelines and principles. Section II: Operational Context and Planning Factors. Details the types of missions that DoD units may participate in and the roles of Joint Task Force members. Also provides a five-phase FDR operation and metrics of success, and how to protect responders. Of particular interest in Chapter 6 are the characteristics of natural disasters, including hazards expected from different disaster types, and in Chapter 7, guidelines for talking to the media. This section provides a broad overview of functional commands and the cross-cutting organizations roles and missions, including Geographic Combatant Commands (GCC) and typical DOD tactical FDR units. 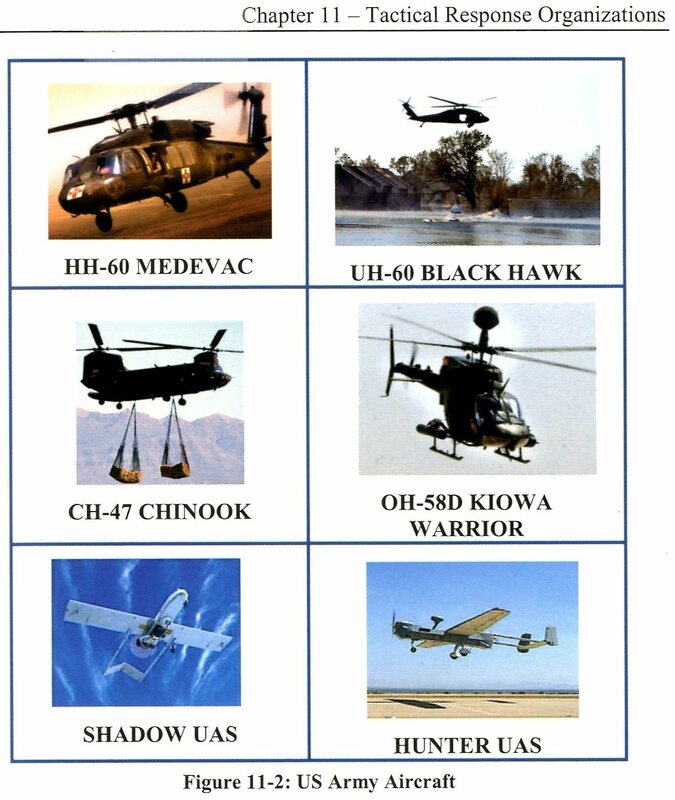 Even shows photos to help identify different U.S. military transportation vehicles that could be used. Section IV: Appendices: A number of extremely useful appendices are included that come in handy for anyone involved in Foreign Disaster Relief. Appendix A presents the legal aspects of FDR operations, such as the list of laws and guidance documents allowing DoD participation in humanitarian relief efforts overseas. For example, the principal authority for DOD to conduct foreign disaster relief is the Foreign Assistance Act of 1961 (Public Law 87-195) (See p. 15 of this compilation of Legislation on Foreign Relations) which “provides the legal guidance for U.S. Government engagement with friendly nations. Appendix B provides the DoD guidelines for interaction with NGOs in a permissive environment. More importantly, it provides excellent color charts showing how civil and military operation centers interact and differ. The page below is an example of how interaction between various civil and military operations in an operations center. Appendix C provides sample formats that are useful to staff who support FDR operations, including excellent example worksheets and sample reports. Appendix D provides a list of useful FDR agency and resources websites. Appendix E provides a list of training courses, both from the Department of Defense and other U.S. agencies like the State Department and the Peace Corps. Appendix F lists references useful in planning and executing FDR missions. Appendix G is a list of acronyms used in this handbook, a must-have for dealing with the military especially, but includes acronyms for international organizations as well. For example, did you know that “OCONUS” means “Outside the continental United States” and “SPINS” means “Special Instructions”? EASY-TO-READ, PORTABLE FORMAT: Throughout the Handbook are color flowcharts, organizational charts, checklists, notes and warnings, making this easier to read than one would expect from a military handbook. And because of its rugged spiral bound format and smaller size, I found this handbook particularly easy to hold in one hand while writing with another, since it could lying totally flat and fold back on itself. Considering that online versions are not convenient in disaster areas, I can see why this is a must-pack item in any U.S. foreign disaster responder’s emergency bag. Overall, the Department of Defense Support to Foreign Disaster Relief (Handbook for JTF Commanders and Below) provides a fascinating and useful insight into how to respond to natural disasters wherever they may happen around the globe. HOW CAN I OBTAIN THIS “Department of Defense Support to Foreign Disaster Relief Handbook “? Find some of the information online. Field Operations Guide for Disaster Assessment and Response by the Office of U.S. Foreign Disaster Assistance (OFDA), print edition available from GPO. This handbook comes at the topic from the U.S. civilian agency perspective, helping members of a Disaster Assistance Response Team (DART) get quickly oriented while on site at a disaster. National Interoperability Field Operations Guide Version 1.4 Provides a waterproof, pocket-sized guide that contains radio regulations, tables of radio channels, and technical reference information, and is a must-have tool for establishing or repairing emergency communications in a disaster area. U.S. Foreign Disaster Assistance Reference Guide from the United States Department of State and U.S. Agency for International Development (online version only). Included are basic fact sheets for 19 funding accounts, each containing citations of important underlying laws, itemizing primary activities (such as Bilateral Economic Assistance, Humanitarian Assistance, Multilateral Economic Assistance, Military Assistance and Law Enforcement Assistance), outlining recent funding history, and describing important statutory restrictions. Legislation on Foreign Relations is a list of U.S. laws governing all aspects of foreign relations, including disaster relief, compiled by both Congressional committees: U.S. House Committee on Foreign Affairs and the U.S. Senate Committee on Foreign Relations. Are You Ready? An In-depth Guide to Citizen Preparedness. This FREE online guide provides a step-by-step approach to disaster preparedness by walking the reader through how to get informed about local emergency plans, how to identify hazards that affect their local area and how to develop and maintain an emergency communications plan and disaster supplies kit. It is produced by Ready.gov, a national public service advertising campaign designed to educate and empower Americans to prepare for and respond to emergencies including natural and man-made disasters. FREE Tornado Safety Guide from the Federal Emergency Management Administration (FEMA) Ready.gov website has important tips on what to do before, during and after a tornado.